Andre Kole’s World of Illusion is a powerful and effective evangelistic opportunity that could have a profound impact on your community. Years ago, Andre Kole (one of the foremost illusionists in the world) was challenged, as a skeptic, to investigate the validity of the miracles of Christ from a magician’s point of view. That investigation eventually led him to receive Christ as his Savior and Lord. For more than 30 years now, he has shared this personal experience with audiences on five continents, seeing an average of over 100 decisions for Christ a night. As the world’s foremost Christian investigator of supernatural phenomena, Andre presents captivating demonstrations exposing the truth about such controversial subjects as astrology, psychic phenomena, and communication with the dead. Andre’s evangelistic presentations have been endorsed through the years by some of the most respected leaders in evangelism. His unique and captivating performances appeal to many non-Christian people who are invited to attend. 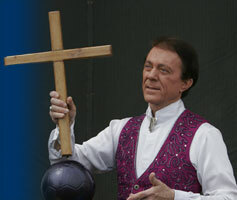 His program features incredible illusions that lead into a thought-provoking evangelistic presentation. Ladies and Gentlemen - Andre Kole." With this introduction, internationally acclaimed illusionist Andre Kole unveils one of his most famous magical creations, the disappearance of a ten-foot-tall Statue of Liberty. In this illusion, Kole makes a replica of the Statue (weighing several hundred pounds and constructed of wood, fiberglass and steel), disappear in slow motion. 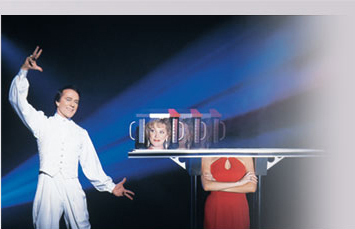 "one of the most remarkable illusions ever attempted on stage, anywhere in the world." The disappearance of the Statue of Liberty is just one of the original illusions Kole has created for his magical spectacular - "World of Illusion." This colorful and unusual stage show features many of Andre's incredible creations. Witness Andre Kole LIVE as he performs many of the original illusions that have won him acclaim as one of the foremost illusionists of our time; including making people appear, disappear, dematerialize, levitate, exposing fraudulent supernatural phenomena, as well as his stage presentation of making the Statue of Liberty disappear. For more information on how to partner with this unique outreach in your community, click here. Don't miss this opportunity to use Andre Kole's World of Illusion as an outreach to your community! An evangelistic outreach where illusion and reality collide!